Every year, I try to take someone hunting who has never gone before and introduce them to one of my favorite pastimes. 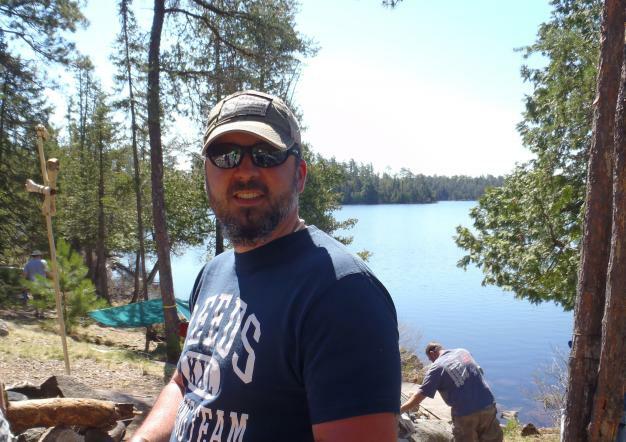 Over the years I have taken many people out for their first hunts, from an Army Sergeant Major to a 12-year-old girl. This year I left the decision up to Facebook. I asked if anyone who had never hunted before would be interested in going squirrel hunting. Many people responded, posting little quips regarding my inquiry, but no one seemed serious. No one, that is, except a woman named DiAnne Zill, otherwise known as my mother. Never in my wildest dreams would I have imagined that I would be taking my mom hunting. After seeing her response to my Facebook post, I called her immediately to ask if she was serious; after all, I have known her my whole life, and as far as I could remember, she had never expressed any interest in hunting. But after I talked to her at great length, her interest made perfect sense. 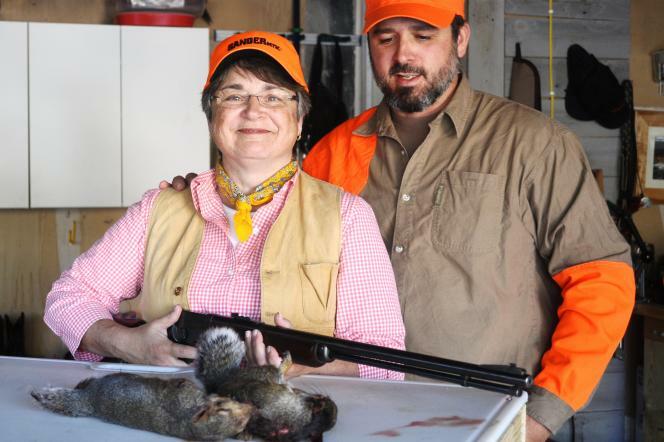 Mom told me that she had always enjoyed being in the woods, and when she was young she had wanted to go along on family hunting trips but had never been invited. Back then, in small town Illinois, girls weren’t allowed to go hunting. Here was this perfect opportunity for her to finally get out in the woods and try something she was never allowed to do. The night before our excursion, Mom and I went through some basics of firearms safety. As a surprise for her, I had talked to my younger brother and borrowed one of his .22 caliber rifles. This particular rifle used to belong to my great grandfather, the man whom my mother named me after. I thought she would get a kick out of using a 100 year old gun that used to be her grandfather’s squirrel gun. We talked about the woods and what we would be looking for.Our quarry for the day was going to be squirrels, although small game season also includes rabbits, grouse, and a few other animals. When you tell people that you are going to hunt squirrels they always look at you and give you the same response: “If you want to kill squirrels you should come to my house, they’re everywhere.” What people fail to realize is that there is a big difference between city squirrels and wild squirrels. One, you’re not allowed to hunt squirrels within city limits. But also, city squirrels are much more familiar with the sight of people than wild squirrels, often letting you get within five feet of them. Sometimes city squirrels will even eat out of your hand. Wild squirrels, however, are like ghosts – they pop in and out of sight at their own accord, in front of you one minute and gone the next. Squirrel hunting would be a lot easier if you were able to hunt them within city limits. For most hunters, public land is our only option for hunting. Occasionally someone with private land will invite you to hunt on their property, but usually we hunters are forced to share land the state has set aside for us. Mom and I were going to be hunting a Wildlife Management Area set aside for public hunting. I had hunted this area many times in the past and been fairly successful. We arrived around 7:00am and walked into the woods. In the early part of the season the best way to hunt squirrel is to still hunt. This means to walk quietly through the woods and then sit for 15-20 minutes, then walk a little bit more and sit again. If you do this all day it can be a very effective technique. We hadn’t been in the woods for more than five minutes when we saw a squirrel, and I said “Mom! Take the shot.” My mom declined, I don’t think she was prepared for how quickly things can happen when hunting; she told me to shoot, so I did. We had our first squirrel in the bag. We were off to a good start. After our initial success, there was a lull in the action for a couple of hours. There was nothing moving in the woods, but there was a small lake next to the woods with geese and ducks and a couple of sandhill cranes kicking up quite a racket. 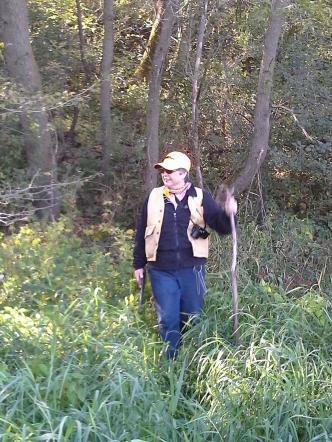 As we moved through the woods, we found several spots that looked promising but produced nothing. We came to a clearing with some downed trees and sat and waited. After about 15 minutes I heard Mom say, “There’s one,” and then asked me if she should shoot it. I told her to go ahead, but by the time she had loaded her .22 rifle, the squirrel had disappeared. Mom and I had a quick conversation about when it is appropriate to shoot, with me emphasizing that she didn’t need permission to pull the trigger. We stayed in that area for a while longer, and eventually I saw another squirrel; I tried to get Mom’s attention, but figured I should just shoot this one myself. We now had two squirrels and the day was looking like a success. I just needed to get Mom a good shot at one and it would be a perfect day. Sadly, we only saw one more squirrel after that, and I missed it. I never got Mom a shot, but she told me that she most definitely had the fever and wanted to try it again. I don’t think she was prepared for how quickly you have to react once you see a squirrel. Out in the woods, squirrels don’t just sit there and let you take your time, they react to every movement and are very good at hiding behind everything. Mom told me that it didn’t matter that she didn’t get anything, she was just happy to spend the time out in the woods. Even though she had been in the woods before, she had never really experienced them in this way. Most of the time we miss a lot of the action going on around us because we are not paying attention. I am pretty sure that if we had stayed out all day, we probably would have gotten her a chance to shoot, but I needed to get back home to start getting things ready for dinner. I had arranged with a few of my friends to have them out hunting in other areas so that if we weren’t successful we would still have squirrels to cook. All total, we ended up with six squirrels – which would make a nice supper for two or three guys. Unfortunately, I was expecting nine for dinner that night. Mom and I cleaned the squirrels and got them ready for dinner. Mom was a little nervous about this part of the hunt because she had never butchered anything before and wasn’t sure she would be up to the task. She watched me do the first one and then dove right in and took care of the second one. As it turned out she was up to it, and she said she felt pretty good about doing it herself. I hear a lot of people talk about getting to know your local farmers and getting to know your butcher and generally knowing where your food comes from. I know where almost all of my meat comes from because I am the only one who ever handles it. There is something very rewarding about knowing that you put in the work not only out in the field, but in the kitchen as well. 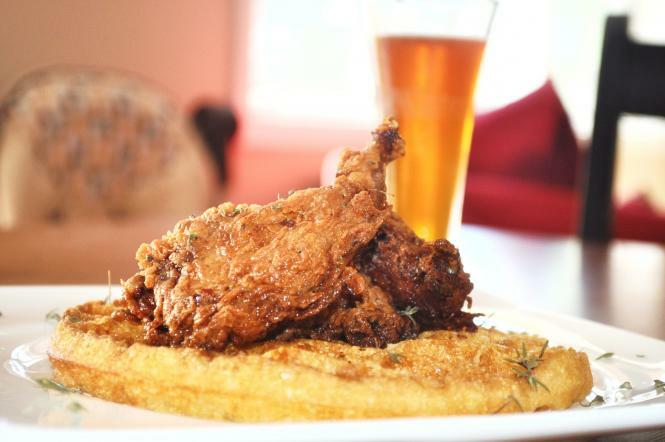 For dinner that night, I served up fried squirrel and waffles, my play on the old southern soul food dish. 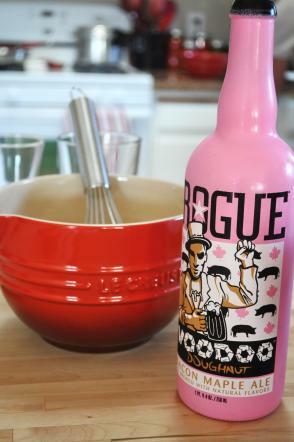 I paired the dish with a beer from Rogue Brewery called VooDoo Donut Bacon Maple Ale, and it was the perfect complement. I didn’t have enough squirrels to feed everybody, so I decided to fry some chicken wings as well. It actually turned out to be a really great idea to serve the chicken and squirrel side by side so that everyone could compare the two. Everyone says that squirrel tastes like chicken, but I can tell you that that is not the case. Chicken has a very neutral, non-descript flavor and doesn’t really stand out; it is more of a vessel for whatever seasoning you used to flavor it. The squirrel, on the other hand, had a rich, nutty quality that made the meat stand out over the breading and the syrup. Squirrel meat is very lean and requires a bit more skill to prepare; when frying squirrel you want to use a lower heat around 300 degrees so that you can cook it a bit longer and allow the meat to loosen up some. If you try to deep fry it at a higher temperature, it will get tough and chewy. As it turned out, everyone preferred the flavor of the squirrel over the chicken, the meat just had more flavor. In the end, Mom might not be ready for a Montana Elk hunt, but I think she got the bug. She told me later that she really enjoyed the simple act of being out in the woods – hearing the sounds and seeing the various flowers. She did great for her first time out in the woods hunting. She told me that she would like to get more comfortable with the rifle and would like to take a hunter safety class. I told her that the Minnesota DNR offers classes year round and they also offer Becoming an Outdoors Woman program, to introduce women to the outdoors. If all goes as planned, Mom might come deer hunting with me in November. But even if nothing else ever comes of it, I can at least say that I took my mom hunting. 1. Mix the buttermilk, sriracha, egg and thyme together with a whisk and marinade the squirrel for at least an hour. 3. Meanwhile, make the waffles: Mix the wet ingredients together, and then mix the dry ingredients separately. Pour the wet into the dry and mix together. Cook on a waffle iron until golden brown and slightly crisp. 4. To make rum maple syrup, heat all ingredients in a sauce pan until well combined. 5. 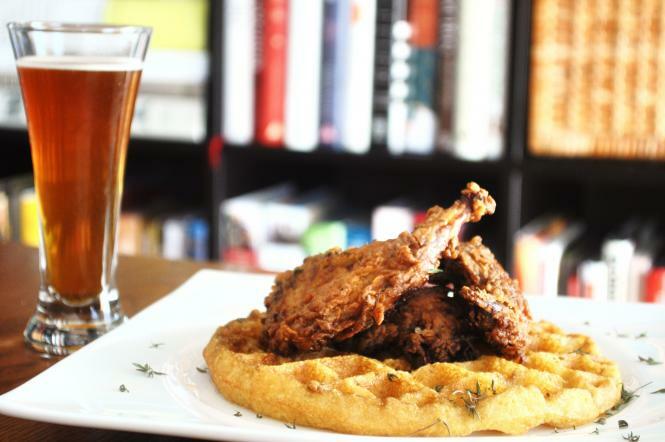 To assemble the dish, place a waffle in the center of a plate and top with fried squirrel. Cover with syrup and enjoy.